NY Studio Gallery is pleased to present “Can’t Live the Commonest Way on Six Bits a Day”*, works by Charlotta Janssen. In her current series, Janssen re-imagines discarded and archival photographs of poor and working class Americans taken before, during and after the Great Depression. While at once cautionary, the images celebrate both the individual dignity and group solidarity of the subjects while capturing the flavor of the times. Janssen paints large scale images from a collection of old Americana photographs. Her color range is narrowed to a somber palette of white, black, aqua and grey iron. 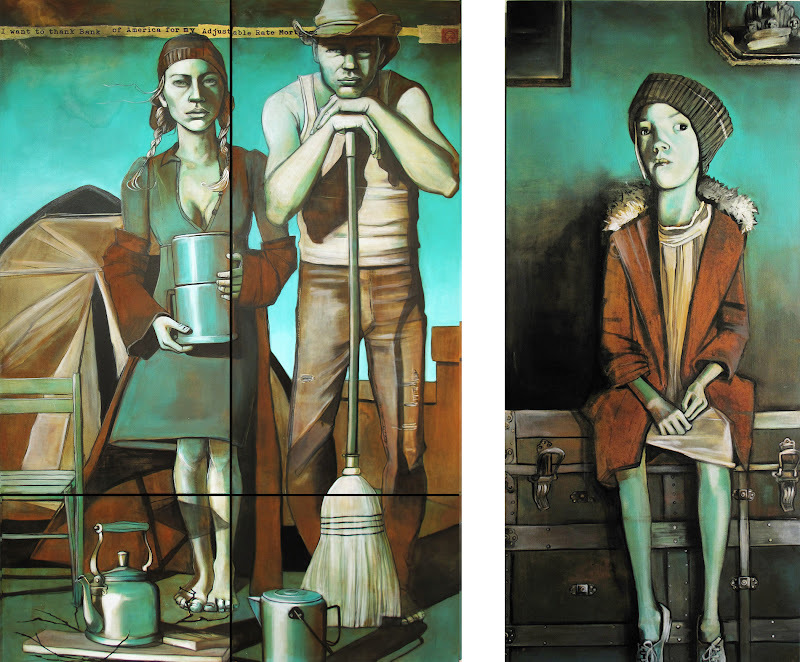 After painting she “rusts” the painting and the grays oxidize and bleed into orange, red and brown tones, giving an antique patina to the stylized faces of the past. Janssen is drawn to the tension between facial expressions and the stoic formality of the age—as expressed through uniforms, suits, dresses, hats, machines, architecture, etc. She says “I like bringing out the kinetic energy of awkward characters from a time past, where smiling for a picture wasn’t expected.” The series brings vibrant new life to the deteriorating images of a past, but all too prescient, era. * Charlotta Janssen was born in Maine to German parents living in America under the Marshall Plan. In 1973 her family moved to Iran, then fled to Germany during the revolution in 1979. She studied painting from 1986-1989 at the University of Arts in Berlin. She has shown in London, (Simon Sieff), Milano (Stragapede Perini & East West Gallery), Shanghai (Culture Salon Art Fair), Miami, Tokyo and New York. Selected shows from 2009 include a solo show at Boltax Gallery, Shelter Island, Long Island, New York and Bridge Art Fair, New York. NY Studio Gallery combines exhibition and workspace to create an atmosphere of interaction, collaboration and integration of media, styles and artistic genres for US and international artists. This entry was posted in Thoughts and tagged Event.